What an amazing night of entertainment. We had Kim Churchill rocking out at the Amphi followed by a packed house for San Cisco, and just when we thought the night couldn’t get any better Passenger turned up to perform a surprise set a Bill’s Bar. What other surprises are yet to come? Deputy festival director Amanda Jakes explained the importance of mixing it up. “We’ve moved them around and we do that because it’s a village that people come to and we want the village to look different every year so that when people come they can get lost and explore. Ever wished your best air-guitar could help hearing-impaired music lovers enjoy a show? Leanne Beer does just that, interpreting live music on stage for the deaf community. “Lot’s of people are fascinated by the signing,” Ms Beer said. 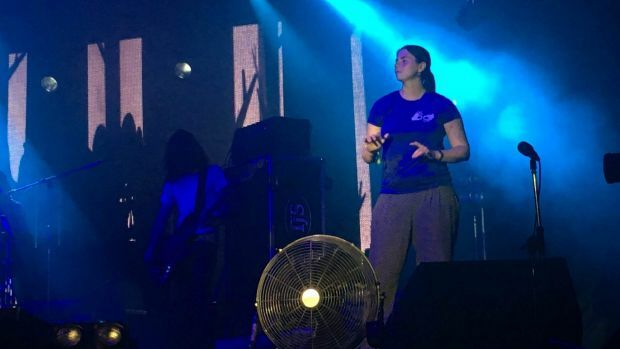 Ms Beer, one of the hard-working Auslan interpreters who can do up to three shows per day, fronted up to a 20,000 strong crowd Monday night interpreting Courtney Barnett’s headline show at the Amphi stage. “We watched a lot of YouTube videos [of Barnett] to rehearse,” she said. She rocks on with them, doing her best air-instrument version of the most prominent instrument, communicating the beat to match the vision. Espresso Yourself – You’ll find the cheerful folk from ‘Espresso yourself’ serving up hot and cold coffee near the main entrance to the festival. Black Crest Coffee Company – The Black Crest cold brew is to die for and a must-try before you leave Woodford. The Mango Shack – The Mango shack loves coffee. And so we love them. With good coffee and good vibes, you can find them near the Dance Hall. Holy Cow Chai Tent – The chai tent is the ultimate place to chill out. With lay lowing tables and an abundance of cushions, relax and enjoy a chai. Eshai – If you’re looking to spice up your coffee, try the Moroccan spiced coffee from this Lebanese bakery near Folklorica. It’s truly amazing. Dot and Herbie – This cute coffee caravan is the perfect place for a coffee on the run. One coffee from here and you’ll be the set for the day. It’s cover classics like Seven Nation Army, Pumped up Kicks and Madonna’s Hung Up, but not as you know them. 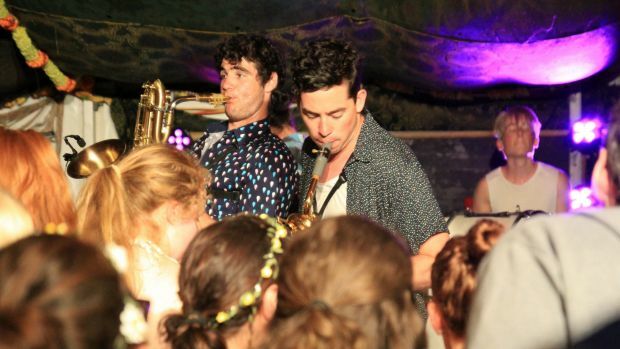 Woodfordians raved their way into the first day of the festival at Hot Potato Band’s first performance. 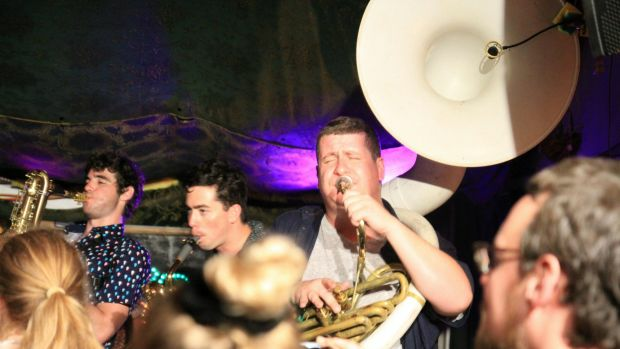 The 10-piece brass band made a name for themselves six years ago by causing a severe case of happy fever on the streets of Cronulla, NSW, with their instruments strapped to themselves. The group broke the stage boundaries by joining the crowd with their instruments for an energetic rendition of “when the saints going marching in”. Popular cover songs mixed with elements of reggae, ska and soul had the Parlour tent pumping and bursting at the seams at 11am on day one and they repeated the performance late night in the Pineapple Lounge on day three. Her day job is charity work Oxfam but come festival time Jessica Wheelock metamorphoses into a butterfly. 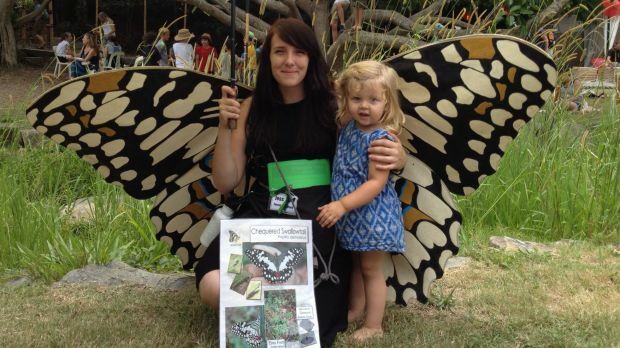 Dressed in a much-larger-than-life costume, Ms Wheelock walks around educating people about the vibrant wildlife at the site and in the surrounding Bellthorpe State Forest. “We’re promoting biodiversity on the festival site,” she said. The Woodford Forest project has recently bought up pine forest plantations in the area in hopes of restoring the original flora and fauna. Volunteers are stationed around the festival to give you the chance to donate a tree for $5. If you’re going to pull off flapper, a big cheesy grin is essential. But don’t let the smiles deceive you, this genre of dance is much harder than it looks. Laughter and the squeak of floorboards filled the Dance Hall as participants tried to master the moves of the roaring twenties in a ‘Great Gatsby dance workshop’. 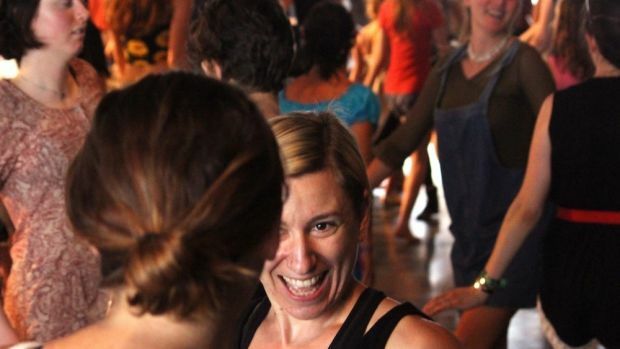 Devilishly fun and flirtatious, this activity was perfect for anyone with a skip in their step and a partner to impress.